← Grass Pants is Going on (Official) Hiatus! And we’re back! Nothing quite gets me back to writing like a bit of a break. Anyway, in my absence, some new champions have come out… but I still don’t get Syndra, so we’re skipping her. Moving on to the carnivorous voidbug! As a writer, I love foils. There’s nothing more enjoyable than two characters that can play off one another with dialogue or motivations or whatever. Now, if you can expand that beyond the narrative, you’ve got me sold. Kha’zix is a perfect foil to Rengar, the last guy I wrote about. Kha’zix is nimble and stealthy, while Rengar will jump on you and beat your face in. Kha’zix is definitely glass cannon material in comparison to Rengar’s built-in tankiness. The thing that really sets Kha’zix apart from everyone else, and why he’s my favorite recent champion, is the evolution system. For the fine folks out there who don’t follow champion releases that closely, Kha’zix gets the chance to evolve one of his basic abilities every time he puts a level into his ultimate, Void Assault. This allows for some insanely cool tricks. You just feel like doing more damage? Make your claws huge! Want more mobility and to terrify people, such as myself, who are afraid of winged insects? Grow a pair of fancy bug wings and flutter about like the butterfly of death you were meant to be. So, yeah, Kha’zix has a ton of options and I’ve never played a game as him where I’ve taken exactly the same choices. I am a fan of evolving claws first (so much damage), but after that it just depends on what I need. It’s really hard to go wrong with your choice (unlike, say, Viktor’s augment upgrade…), so you’re not punished for accidentally evolving something you didn’t mean to, which I have done many, many times. So, as far as my personal build goes, I just take a standard glass cannon route, not too different from what Phreak recommends in the Champion Spotlight. I feel like Kha’zix has enough built in damage that it’s better to play to his strengths than trying to make up for his squishiness. I would be willing to say you could potentially get something like Frozen Mallet as a luxury item (especially if you don’t evolve spike racks) for some tankiness and a reliable slow. Finally, I’ve got to talk about the absolute brilliance that is The Hunt is On!. When I first saw this pop up on the League subreddit, I was concerned. It seemed like such a gamebreaker to let Kha’zix hit something beyond his normal potential or giving Rengar a death-proof, fully stacked Bonetooth Necklace. I’ve only been in one Hunt so far, as Kha’zix of course, and… I’ve honestly never had so much fun in this game. I nearly lost, but the tension building up to that fight was insane. The result – at least in terms of Kha’zix – didn’t seem too imbalanced, either. It was fun, it was clever, and it tied into the lore! It took a normal match of League and gave it a new little element of strategy. Do you actively hunt him down or do you just let things happen? It’s great and Riot really should look into doing more things like this. 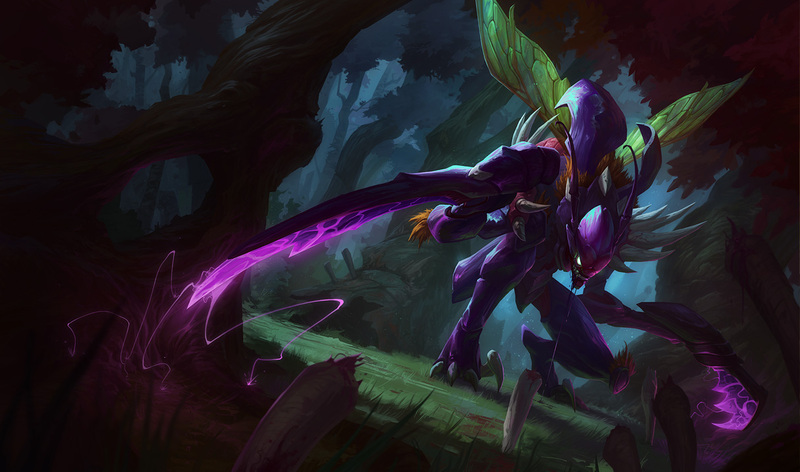 Anyway, Kha’zix is definitely for people who like being sneaky and jumping around. He’s the most fun champion I’ve played since Jayce and he’s certainly worth a purchase – or at least a shot during free week. Feels good to be back, guys. As always, thanks for readin’ and have a good’un. This entry was posted in League of Legends, Video Games and tagged kha'zix review, kha'zix the hunt is on, kha'zix the voidreaver, league of legends, league of legends champion impressions, league of legends champions, riot games. Bookmark the permalink. Also, have you checked out my fan-made champ, Cerule? My guess is we haven’t seen much of him because a lot of people (at first, anyway) thought of him as Rengar 2.0. Also, just read the concept (no idea how I missed it) and I absolutely love it! Been wanting someone who does a lot of movement-related stuff (Hecarim doesn’t count) for a while now. The Hung is On is an awesome feature and I hope Riot will implement more interesting stuff like this. 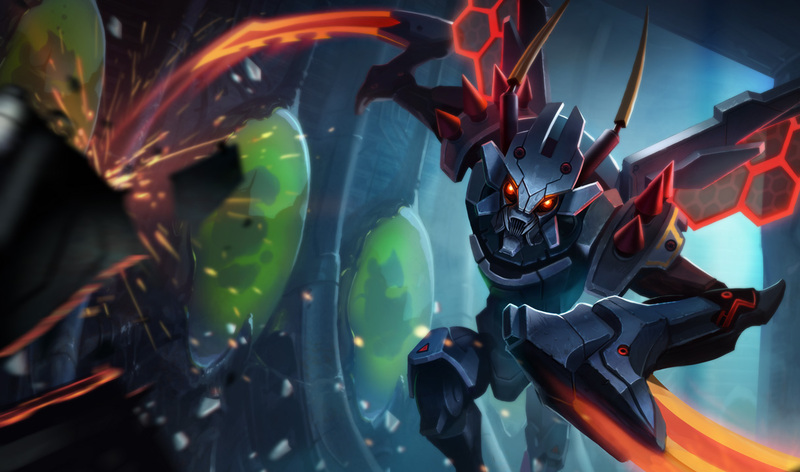 I’ve basically mained Kha’Zix now because of the utter badassery of the Mecha skin and the uniqueness of his “evolving” gameplay. His Wing upgrade is always a must have, having the initiation/escape skill that has twice the range of flash is amazing. His Spike evolution is completely decimating, not only does it deal fair amounts of damage by itself, upgrading it increases the area of effect and it consumes the 220 (at lvl 18) magic dmg from the passive. The hardest part for me is whether to choose to upgrade R or Q. I’ve usually been taking his R but now I’m thinking of upgrading his Q now. Phreak is pretty spot on with the spotlight, Kha’Zix deals dmg in bursts and shouldn’t really be auto-attacking. My personal build is starting with Boots plus 3 pots. Eventually last hitting with minions with that 25 mana cost Q gets me a BF Sword real quick. Then go on to make CDR boots, Brutalizer (to Youmu’s later on), Bloodthirster, and then Last Whisper. Either before last whisper or before, I tend to make a Maw of Malmort incase they have a lot of AP’s. Late game, an Infinity Edge does the trick and maybe a Guardian angel to make you more of a pain to deal with. I’ve honestly never gotten CDR boots on Kha’zix (usually end up against a handful of right-clickers on their team, so I grab ninja tabi). Will definitely be trying that next game, though, especially considering his already short cooldowns. Agreed about everything else in terms of the build, though. Seconding the comment about Wing, too. I’ve never noticed too much of a difference with his spike upgrade (mostly because I’ve always grabbed it last or not at all), but I’ll keep it in mind. I’m really fond of upgrading his ult because it makes him reasonably beefy for a half-second or so, which is usually all the time you need. I’m also really psyched for more of these mini-events. If I didn’t mention it in the post, I ended up scaring the hell out of my niece (was in the same room, playin’ some Wii) with my victory cheer. It adds so much tension and crazy stuff to the game, without completely breaking it or anything. The spike upgrades not only increase your dmg, but if you’re going solo top you’ve already gotten to lvl 6 pretty quick. Because I take 2 levels in my claws and 2 in my spikes, both deal good amounts of dmg. Upgrading the Q is a good choice but the enemy has to be isolated to get the full amount. However, upgrading the Spikes early allows you to clear the minion wave the other champion is near and proceed to destroy him with your claws. The cone effect will also deal damage to him which will probably slow him as well, allowing you to quickly catch up with your ultimate and the combination of the passive and claws will deal tremendous damage. If he flashes, well just leap toward him. Okay, yeah, the spike thing makes sense. Definitely going to be giving that a shot tomorrow! Bigger fan of Jayce, myself. He’s more versatile. Doesn’t he fall off later if he doesn’t do well? Not sure, I’ve had reasonably decent success with him even after a rough start.